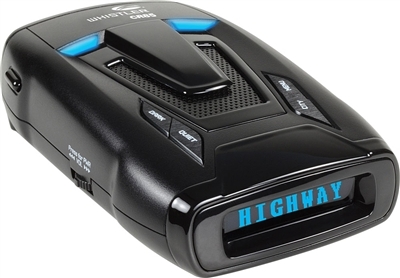 If you’re shopping for a good radar detector costing less then $150 I would recommend the Whistler CR85. As demonstrated during this 1-minute video, both the CR85 and CR95 will provide you with ample time to slow down during a constant on K or Ka-band radar speed trap. And as both the CR85 & CR95 are rated as 2-star radar detectors they will provide you with adequate warnings in many instant on encounters which are less then a mile away. We would also rate the filtering characteristics of the Whistler CR85 and CR90 as exceptional as both do a commendable job at filtering out those pesky false alerts caused by those adaptive cruise control sensors car manufactures have been installing in n many of their new cars, which use the exact same K-band frequency police use. And another benefit is the Traffic Flow Signal Rejection (TFSR) feature which when enabled will block the signals from the traffic flow sensors installed on many highways. Whistler CR85 Laser Performance is also exceptional, exceeding all the other detectors in its class and when coupled with the VEiL’s Stealth Coating, you should have ample time to slow down and avoid being ticketed during police lidar encounters. The Whistler CR85 has clear voice alerts which will provide you with the information you need without having to take your eyes off the road. The CR85’s blue OLED display is a little larger than most which makes if easier to read at any angle, even in bright sunlight. One thing you may notice once you receive your Whistler CR85 or CR90 is that they don’t package it in fancy travel case like some of the other manufactures do, which ultimately raises the cost of the detector. Instead they package their detector in an environmentally friendly cardboard box which enables them to keep their costs down, which ultimately saves you money. Because of this the Whistler CR85 is the ONLY RADAR DETECTOR costing less then $150 which I recommend buying. I have a Harley Davidson with a cigarette lighter plug. I was hoping to buy the Whistler 90 and use it with both my truck and motorcycle. Would this work or would you suggest the TPX2.0 ? I would think the big advantage with the TPX is it has a battery. But again with a cigarette lighter plug in on my H.D. one wouldn’t be needed. Mounting I could figure out, there are a lot of accessories I could use to make it work. hey roy,does the whistler 85 pick up the new digital radar guns that you mentioned in the passport radar?